La Maison Compound: A rare find, large unique vacation home divided into 3 separate contiguous units is perfect for large groups wanting all the comforts of home with close proximity to everyone has 3 private quarters for sleeping and getting away from group hustle and bustle. Each unit is equipped with Blu-ray flat screen TV, Netfix, wi-fi, kitchen, bathroom, living room, fireplace, outdoor patio or balcony deck for outdoor living space. 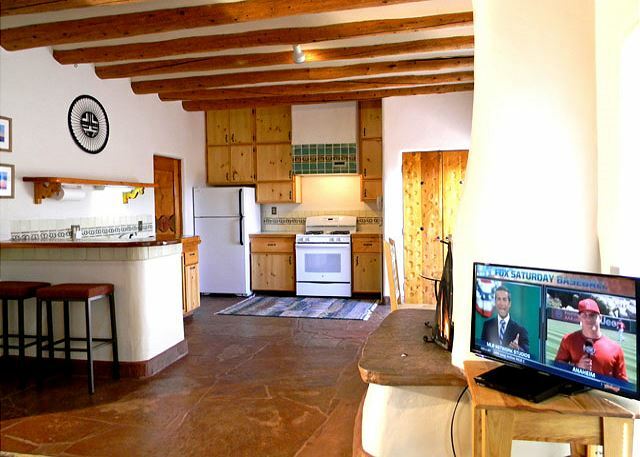 A large upscale “Hot Springs” hot tub overlooks the babbling “acequia” stream in the wooded back yard of this special vacation rental offering very affordable seasonal lodging rates. New to the word “acequia”? “Acequia’s” are a network of irrigation streams (fondly called “ditches” in English) native to New Mexico and have been in use for hundreds of years. For anyone not familiar with the thousands of miles of the New Mexico acequia irrigation network, you can read the compelling “Milagro Bean Field War”, by author John Nichols (still alive and active as a senior resident of Taos, NM). Or, Google the movie (of the same name), directed by Robert Redford in 1988, to learn of this fascinating historic story. 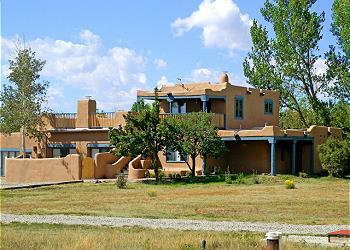 At one time, the charming 2nd story studio was the home and studio of nationally known artist, Rory Wagner. Today, La Maison is owned by another publicly recognized artistic couple and the upscale furnishings show their tasteful artistic flare. 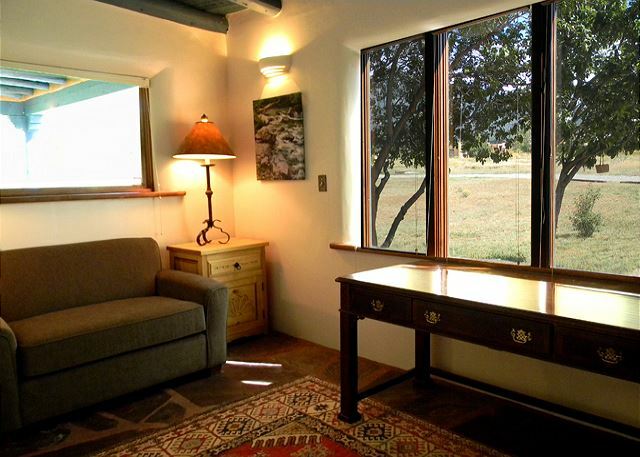 From all 3 units, panoramic mountain views are available during the day and breathtaking sunsets are seen at night. 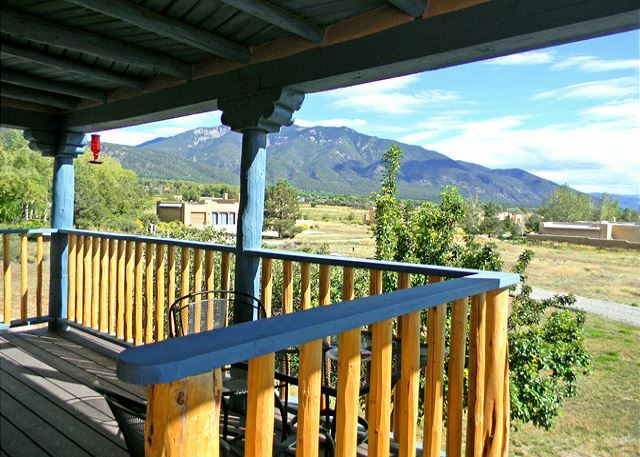 Dine outside on any of the three patios or the upstairs deck. 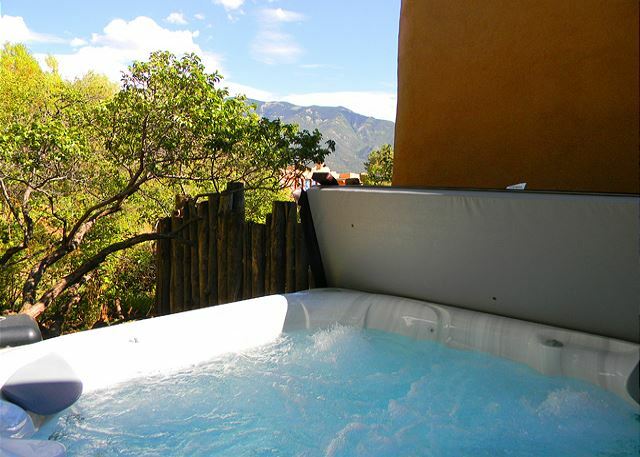 Relax the day away in the professionally maintained Hot Springs hot tub or lounge alongside the rippling acequia stream. The clubhouse indoor pool and outdoor tennis court are complimentary for guests of La Maison. Each unit is architecturally packed with southwest custom features of viga ceilings, kiva fireplaces, slate or hardwood floors and imported Talavera tile bathrooms. The two ground floor units each have wood burning fireplaces. The spacious studio has a romantic “Candles only” fireplace, meaning no messy clean up required before the next romantic glowing fireplace burn. 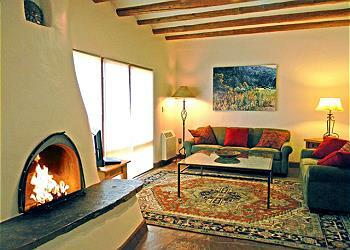 La Maison is 8 miles, 15 minutes from Taos Ski Valley with no stop signs or stop lights. Another 8 miles and 15 minutes in the opposite direction finds you on the outskirt boundary of the Village of Taos, New Mexico. Convenient location does not get any better than this for guests heading in both directions for their vacation fun. The 3 units are very clean, extremely comfortable and generously furnished with bath towels, bed linens, kitchen equipment and tableware. 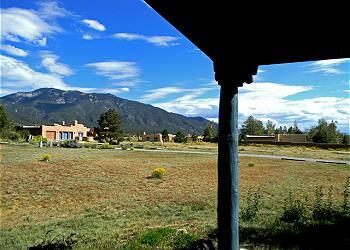 Everything your group needs is here to provide a wonderfully memorable Taos, New Mexico lodging experience. To view each component of the compound individually you may go back to the search box and select "Sleeps up to 4" and scroll down to La Maison where you will see the Studio, West and East Wing on our website.